I designed a concept for Virgin Atlantic's iOS app because their current app (2014 Version) was in need of a major update. After sending it to chairman Richard Branson and CEO Craig Kreeger I was invited in to meet some of the team and later hired as a Brand Designer. The redesigned version has a greater emphasis on functionality with a cleaner, more beautiful design. 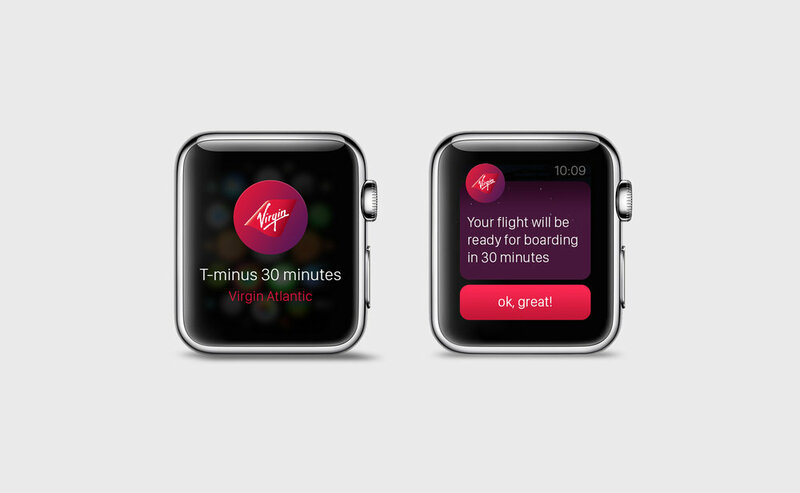 More recently I have created designs for a watchOS app, and have worked on Virgin Atlantic's brand design team for a variety of projects. This new design has a large focus on imagery, with a confident use of the Gotham typeface. This coupled with neat iconography and fun animations creates a clean, current aesthetic. The main navigation is now a collection of large images that passengers can scroll through, allowing for a more engaging experience; with room for many more features than a traditional 5-page menu. This overhaul brings a fresh, clean look that stays true to the Virgin Atlantic brand. A design for Apple Watch. Taking it further with an experience for watchOS unlike any other. I designed this version of the app to provide a more intimate level of interaction. It features the same navigation and gestures used throughout watchOS so passengers get a consistent experience, but this interface has been dressed with Virgin Atlantic's unique flair. As users swipe across pages, an aircraft pans across bringing a more joyous experience. Apple's San Fransisco Condensed typeface is used for consistency and legibility on a small screen. Notifications look vibrant with subtle twinkling stars, fun copywriting and brand colours. After sending my designs to Chairman Richard Branson and CEO Craig Kreeger, I was invited into Virgin Atlantic's Head offices to meet some of their key team members. I later joined the brilliant Brand Design team to work on a variety of projects for the airline. After joining the brilliant brand design team, I worked on a variety of projects including ads, interface elements, documents, on-board passenger products, film props and signage. Explore a refined selection of my work below. While I would love to show you many of the exciting things I worked on, they are for internal use only or understandably confidential at this time. iPhone, iOS, Apple Watch and watchOS are trademarks of Apple Inc., registered in the U.S. and other countries. Logo and Images from Virgin Atlantic. © Virgin Atlantic Airways Limited. © Delta Air Lines. © Harry Potter and Fantastic Beasts Publishing Rights. © JKR © WBEI. App designs are original artwork by Adam Marsh. All rights reserved.